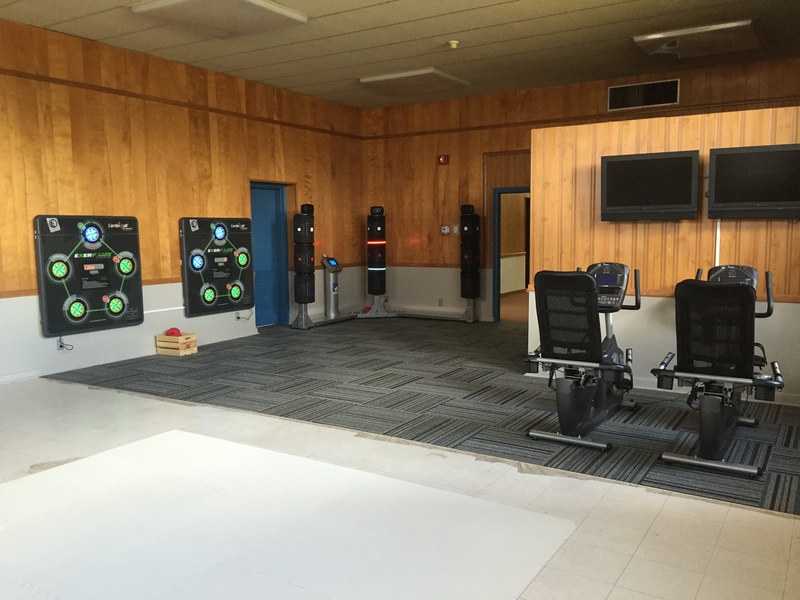 The Carlisle YMCA in Carlisle, PA joins the huge family of YMCAs that have invested in exergaming and interactive fitness. 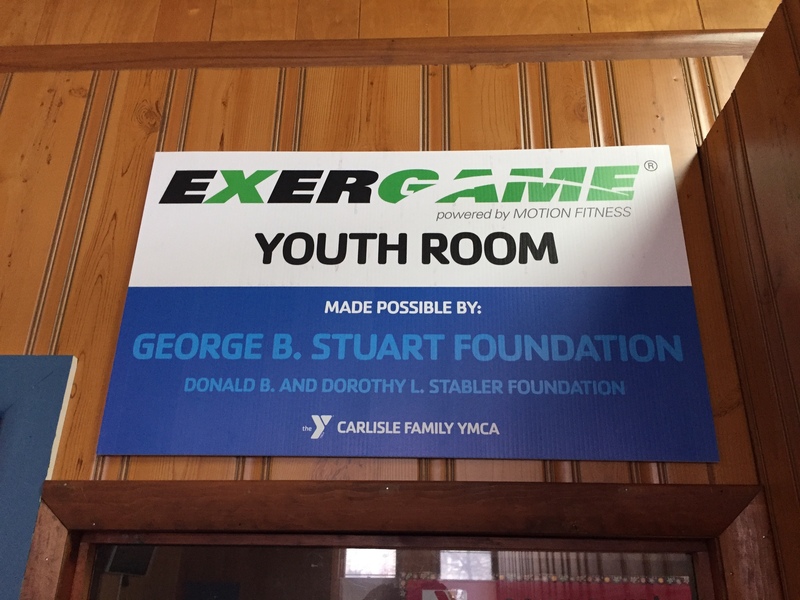 They have dedicated a whole room to be made into a youth fitness center. Their Youth Room is nicely furnished with a great layout for both the products and for kids running around being active. As shown in the photo below this area was made possible by the George B. Stuart Foundation. The Carlisle YMCA’s Youth Room includes: the Fit Interactive 3-Kick, Exerbikes, EyePlay Floor, and a pair of CardioWall Duos. All of the products in this room service their own purpose for the kids’ for example, theEyePlay will be great for younger kids who like something more casual and the Exerbikes will be good for pairs of kids to compete but not have to worry about fitness skills. While on the other side they have the 3 Kick and CardioWalls, which assist the kids in developing by using reaction, speed, and functional movement training. These even more useful for kids fitness because it is much easier for a group of kids to play on one machine, giving everyone something to do and accomplish.This space also helps out the EyePlay Floor specifically, the space and lighting situation being perfect. This space also helps out the EyePlay Floor specifically, the space and lighting situation being perfect. There is plenty of space for it and around it for running around and plenty of windows to make sure the lighting is perfect for the EyePlay Floor. This is a very important aspect of the EyePlay Floor main functionality so this is a big plus. This room shows a great example of what an exergaming room can be and really, should be. A clean, spacious area that gives kids the ability to be kids, run around and be silly while also having ample room for the products themselves. Because the kids are always going to want to run around and be kids so it is useful to facilitate that next to the exergaming equipment that can help them transfer their energy and focus into something else. The future looks bright for the kids of the Carlisle YMCA, this Youth Room will give plenty of kids the opportunity to be active, be social, make friends, and discover something new. To see our main concept of youth fitness and the Youth X Room take a look here. 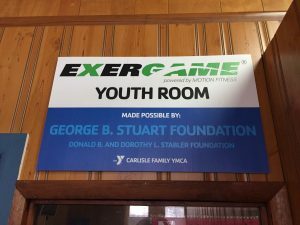 To see the full photo gallery of the Carlisle YMCA’s Youth Room, click here to see our SmugMug gallery of the room! And for more exergaming news and updates about interactive fitness products, follow us on Facebook and Twitter.